The connection between them has become, “How was your day?” to which the other responds, “Fine,” because it’s just easier than sifting through all the details. The space between them has been filled with shuttling the kids to their activities, play dates, homework and maybe six hours of sleep at night, if they’re lucky. The intimacy between them has been stifled as they’re each exhausted and rarely intimate with each other. Dan is a decent man and a good father. Mary is in a marriage that is good enough. It’s not painful enough for her to leave, but it’s not inspiring enough for her to stay. She no longer wants to limit her life and live in what feels like a small, dark box, but she fears all the unknowns that would await her if she made a change. 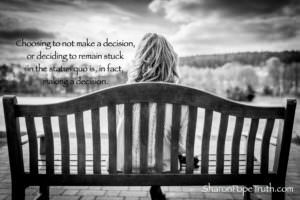 When we’re facing a life-altering decision, it’s easy to see how we can become stuck, trapped and frozen in our steps. But not making a decision, or deciding to remain in the status quo is, in fact, making a decision. As a Love Coach, I speak to women every day in crisis in their marriage or relationship. They are simultaneously both desperate to do something to escape the loneliness and scared to death about what lies before them if they do. They don’t know how to be in their existing relationship and they don’t know how to leave. I will ruin my kids’ lives. Other people will judge me. How will I support myself? Will I make enough money? Maybe this is better than being alone. What if I end up alone for the rest of my life? It’s going to be really difficult to find someone else. Maybe the kind of relationship I want doesn’t exist. It’s brand new. It’s completely free. It’s all for you. I hope you’ll join me.